Zach is a cool guy who knows his NBA. That's all I need. Zach Lowe on "I'm Interested"
Mike Greenberg talks to Zach Lowe about his expectations for the 2018-19 season (1:30), the historical context of the Warriors' greatness (9:10), the forgotten era of the league (18:00), expectations for LeBron James in L.A. (31:15), the biggest threat to come out of the Eastern Conference (40:30) and much more. Zach talks to new Sixers GM Elton Brand about his new job, Philly's future, his winding career, and much more. Zach talks to Rafe Bartholomew and ESPN's Jackie MacMullan about "Basketball: A Love Story," their must-read new oral history of basketball. Zach talks to author and NBA contributor Ian Thomsen on this novel The Soul Of Basketball that examines the 2010-2011 season and the key players from that season that helped shift the NBA's popularity, marketability and more. Zach talks to Bleacher Report's Howard Beck about this year's Hall of Fame class (7:30) and some interesting Hall of Fame cases to be made for players down the road. Zach talks to ESPN's Royce Young about the Thunder's offseason, and then Chris Herring of 538 (35:00) about the Rockets, Carmelo Anthony, and much more. Zach talks to ESPN's Michael C. Wright about the Kawhi Leonard fallout now that the dust has settled, how the Spurs can remain relevant, the stories that may come out & more. Zach talks to ESPN's Kevin Arnovitz (:20) and Bruce Arthur of the Toronto Star (31:00) about the Kawhi Leonard trade. Zach talks to ESPN's Nick Friedell about the Bulls signing Jabari Parker and then Brian Windhorst about what comes next for the Bucks -- plus Kawhi, Lakers and much more. Zach talks to Howard Beck and Rachel Nichols about potential postseason restructuring (3:42), the Lakers' rebuild (18:50), Kevin Durant's future (27:00) and much more. Zach talks to Utah's Rudy Gobert about his rise in the NBA, chasing Golden State, Donovan Mitchell, proving doubters wrong, and more. Zach talks to The Athletic's Tim Kawakami about Demarcus Cousins signing with the Warriors. Zach talks to Brian Windhorst about LeBron heading to Los Angeles to play for the Lakers and all things free agency. Zach and ESPN's Kevin Arnovitz pick their five most intriguing free agency teams. Plus, they discuss LeBron, Paul George, the cap boom coming in the summer of 2019, and much more. Zach talks to Rachel Nichols & Brian Windhorst about the NBA draft, LeBron's future, the impact on the rest of free agency and much more. Zach talks to ESPN draft expert Jonathan Givony about this week's NBA draft -- trade rumors, swing picks, players who might rise and fall, and much more. Zach talks to Howard Beck of Bleacher Report about LeBron's 3-6 Finals record as well as his place in history (4:19), fun what-ifs (15:32), Golden State's culture (55:55), Kevin Durant weirdness (1:01:32) and much more. Zach talks to Warriors coach Steve Kerr about another championship (:30), the struggles against the Rockets (22:20), re-connecting with Kevin Durant (34:30), the future of the team (39:45) and much more. Zach talks to Chris Herring and Ethan Strauss about Bryan Colangelo and the Sixers parting ways (1:32), the Warriors putting the Cavs in a strangle hold (14:17), Golden State's ultimate legacy (37:45) and more. Zach talks to Doris Burke about her new contract (3:40), the 2018 Finals (29:45), her preparation for broadcasts (10:58), favorite career moments (18:13), and much more. Zach talks to Brian Windhorst about J.R. Smith's gaffe (:45), the possibility of a Kevin Love suspension (9:13), LeBron's performance, level of frustration (16:49) and more. Zach talks to ESPN's Kevin Arnovitz about the strange story surrounding Bryan Colangelo in Philly (:24), the NBA Finals (25:53) and more. Zach talks to Marcus Thompson of the Athletic about the Western Conference finals, the stakes for the Warriors (3:00), Chris Paul's injury (5:44), and much more. Zach talks to Bleacher Report's Howard Beck about the prevalence of isolation basketball (7:28), Houston's evolution (24:30), Boston-Cleveland (42:49), and much more. Zach talks to ESPN's Brian Windhorst (00:27) and Tim MacMahon (36:30) about the conference finals. Zach talks to Bill Simmons of The Ringer about the Eastern Conference Finals, the crazy NBA summer ahead, lost hoodies, and more. Zach talks to David Thorpe about Dwane Casey's firing, the Western Conference finals, and more. Zach and ESPN's Kevin Arnovitz discuss all of the conference semifinals series as they currently stand, break down what the future holds for the Raptors and more. Zach talks to ESPN's Brian Windhorst and Dave McMenamin about Cleveland's wild Game 1 win in Toronto, how the Raptors can respond, and more. Zach talks to ESPN's Kevin Arnovitz about Raptors-Wizards (1:04), isolation basketball, Wolves-Rockets (39:34), and more. Zach talks to ESPN's Brian Windhorst about the bizarre Cavs-Pacers series. Zach talks to Chris Herring of FiveThirtyEight about Pelicans-Blazers (5:52), Jrue Holiday's great series, how concerned the Cavs should be (22:26), Thunder-Jazz (48:10), and Donovan Mitchell. Zach talks to Dan Devine of Yahoo! Sports about Wizards-Raptors (1:53), Thunder-Jazz (18:25), Rockets-Wolves (38:33), and Sixers-Heat (56:08). Zach and David Thorpe go rapid-fire through all eight first-round playoff series. Zach talks to ESPN's Royce Young about the Thunder's strange season, Paul George's shooting slump, Carmelo Anthony's down year, Billy Donovan, and playoff hopes. Zach talks to ESPN's Chris Forsberg and Bruce Arthur of the Toronto Star about the Celtics, Raptors, Cavs, East playoff matchups, Coach of the Year, and much more. Zach talks to Bleacher Report's Howard Beck about his Jason Kidd feature (3:03), LeBron's MVP case (31:15), playoff races (44:15), and more. Zach talks to Hornets coach Steve Clifford about his health scare, the Ty Lue situation, Kemba Walker's development, the mid-2000s Rockets, Stan Van Gundy Magic, and more. Zach talks to ESPN's Jackie MacMullan about Chris Bosh's desire to play again (3:00), NBA players opening up about mental health issues (45:00), the Rockets (21:00), the Kyrie trade (50:00) and much more. Zach talks to ESPN's Kevin Arnovitz about the Eastern Conference playoff race, the Sixers threat, Washington without John Wall, the evolving Heat, and more. Zach talks to the NBA's Monty McCucthen about player-referee relations, crunch-time officiating, his biggest mistakes, flops, tricky rules, and more. Zach talks to ESPN's Tim MacMahon about the wild Western Conference playoff race, Anthony Davis' MVP case, the scuffling Thunder and more. Zach talks to Nets point guard Jeremy Lin on his future in Brooklyn, the highs and lows of Linsanity, his relationships with Melo and Kobe, and more. Zach talks to Rockets GM Daryl Morey about acquiring Chris Paul, the last secret of the James Harden trade, his rental car return habits, Hakeem Olajuwon's ping-pong skills, and more. Zach talks to former Cavs GM David Griffin about the Kyrie Irving trade, Cleveland remaking its team mid-season, his time with the Seven Seconds or Less Suns, and more. Zach talks to Jonathan Abrams of Bleacher Report about his new oral history of "The Wire." Zach talks to Bleacher Report's Howard Beck about Steve Kerr's coaching gambit (4:59), the new-look Cavs (17:35), the oncoming tank brigade (33:50) and much more. Zach talks to ESPN's Brian Windhorst about Cleveland's wild trade deadline (2:44), LeBron's future (14:15) and other deals that were made this week (44:12). Zach talks to ESPN's Adrian Wojnarowski about the chaos in Cleveland, what to expect out of several teams at the trade deadline and much more. Zach talks to Sports Illustrated's Lee Jenkins about the Blake Griffin trade and more. Plus, ESPN's Ramona Shelburne and Rachel Nichols pop in to talk more trade rumors, Chris Paul in Houston and many more topics around the NBA. Zach talks to ESPN's Brian Windhorst about the Cavs' dysfunction, possible lineup changes, trade candidates, the All-Star draft, gambling and more. Zach talks to Bill Simmons of The Ringer about Clippers-Rockets craziness (:45), Eastern Conference All-Stars (14:12) and much more. Zach talks to Wolves analyst Jim Petersen about the rising Timberwolves, Jimmy Butler's impact, the environment under Tom Thibodeau, private Prince concerts, and more. Zach talks to Jeff Van Gundy about the state of the NBA at the halfway point, dangerous playoff underdogs, the All-Star game, and more. Zach talks to Heat PG Goran Dragic about the Miami culture, Waiters Island, winning Eurobasket, Shaq's rookie duties, being left-handed and much more. Zach talks to Eric Koreen of The Athletic and Bruce Arthur of the Toronto Star about all things Raptors, the Eastern Conference and more. Zach talks to Toronto coach Dwane Casey about the new-look Raptors, coaching in Japan, the 2011 Mavericks, Southern lingo, and much more. Doubletruck Stories: The Lakers drafted Lonzo Ball to be the star of their post-Kobe era. There's just one (possibly insurmountable) problem: Dude can't score. By Kevin Arnovitz. Zach talks to ESPN's Doug Kezirian about why the Warriors are hard to bet (2:00), the future of sports gambling (15:15), living in Vegas (29:10), working in TV (40:30) and more. Zach talks to ESPN's Kevin Pelton and Ramona Shelburne about Joel Embiid (15:10), the Sixers (34:11), surprise teams in the East (42:30), the Thunder's issues (51:09) and more. Zach talks to ESPN's Kevin Arnovitz about the Jahlil Okafor trade (4:25), the red-hot Rockets (19:53), disappointing Western Conference teams (38:52), and more. Zach talks to ESPN's Rachel Nichols about David Fizdale's firing, the reeling Clippers, hot food and beverage takes, her best and worst interviews and more. Zach talks to Jeff Van Gundy about the Wolves' defense, the Thunder's struggles, the Clippers' collapse and strange starts across the Western Conference. Zach talks to Howard Beck of Bleacher Report on Celtics-Warriors, the Cavs' issues, the top of the East, the Nuggets and more. Zach talks to Utah's Joe Ingles about his one-in-a-million path, Gordon Hayward leaving, American foibles, Quin Snyder's midnight texts, Dante Exum hero worship and more. Zach talks to Denver Nuggets guard Gary Harris about rebounding from a bad rookie season, the way of the Joker, altitude sickness, the future of the Nuggets and more. Zach and ESPN's Brian Windhorst debate six pressing questions about the Eastern Conference. The Lowe Post shares the trailer for Season Two of 30 for 30 Podcasts, launching November 14th, as well as one of our favorite episodes from Season One, A Queen of Sorts. Zach talks to ESPN's Kevin Arnovitz about the rise of Giannis Antetokounmpo (1:50), the future of the Bucks (19:32), the surprising Grizzlies (43:10) and more. Zach talks to Ben Falk of "Cleaning The Glass" about The Process in Philly, the Phoenix debacle, early trends and more. Zach and legendary Sports Illustrated writer Jack McCallum discuss his new book on the Warriors, the 1972 Lakers, Jerry West, Wilt Chamberlain, Elgin Baylor and more. After sharing his thoughts on the latest news involving LaMarcus Aldridge, Zach talks to comedian and NBA superfan Joe Mande about his beloved Wolves, the best and worst new Nike jerseys, writing for "The Good Place," the art of stand-up and more. Zach talks to ESPN's Ryen Russillo about the Joel Embiid extension (1:02), teams chasing the Warriors (16:43), the Lakers' future (40:38) and more. Zach talks to Jeff Van Gundy about roster upgrades in Cleveland and Oklahoma City, chasing the Warriors, the bottom of the Western Conference playoff race and more. Zach talks to ESPN.com's Kevin Arnovitz about Carmelo Anthony, not sticking to sports and the most confusing teams heading into the NBA season. Zach talks to ESPN's Jackie MacMullan about her career, Larry Bird, Magic Johnson, Kyrie Irving, Danny Ainge, Lawrence Taylor throwing hair-dryers at her and much more. Zach talks to The Wall Street Journal's Sam Walker about his book on sports dynasties, "The Captain Class," analytics, the Warriors and Cavaliers, Michael Jordan, and more. Zach talks to Howard Beck of Bleacher Report about the Kyrie Irving trade, the Lakers' tampering, Paul George and more. The world is quick to label Darko Milicic an epic NBA bust, but here are 10 reasons he is an utter success. By Sam Borden. Zach talks to ESPN's Brian Windhorst about the Kyrie Irving situation and which teams could make a play for the Cavs' guard. Zach talks to ESPN's Ryen Russillo about Cleveland's offseason, LeBron's future, Boston, the Pelicans, and much more. Zach talks to ESPN's Ian Begley and Bleacher Report's Howard Beck about some Carmelo Anthony trade scenarios, the state of the Knicks, and much more. Zach talks to Lakers coach Luke Walton about Lonzo-mania, coaching amid free-agency rumors, being a rookie on the Kobe- Shaq Lakers, and more. Zach talks to Jerry Stackhouse about coaching in the G League, his ambitions, fights, trying to reach Deron Williams and much more. Zach and ESPN's Tom Haberstroh break down the winners, losers, and big questions of NBA free agency. Zach talks to ESPN front office insider Bobby Marks about Paul Millsap going to Denver, the Raptors running it back, what's next in free agency, and more. Zach and ESPN's Kevin Arnovitz pick their five most intriguing free agency teams. Zach talks to ESPN's Ramona Shelburne about the Chris Paul trade, Phil Jackson, free agency, and more. Zach talks to ESPN NBA Insider Brian Windhorst about the NBA draft, the deals that were made and the deals that might still come as free agency approaches. Zach talks to ESPN's Kevin Arnovitz about Paul George, the Boston-Philly trade, the coming offseason, and more. Zach talks to Warriors coach Steve Kerr about the team's title run, the post-title party, LeBron's greatness, a White House visit, and more. Zach talks to Howard Beck of Bleacher Report about Golden State on the verge, the lack of parity in the NBA, super teams and more. Zach talks to ESPN's Ramona Shelburne and Brian Windhorst about the Finals, the future of Golden State and Cleveland, Paul George and more. Zach and ESPN/ABC NBA analyst Jeff Van Gundy do a comprehensive breakdown of every angle of the NBA Finals. 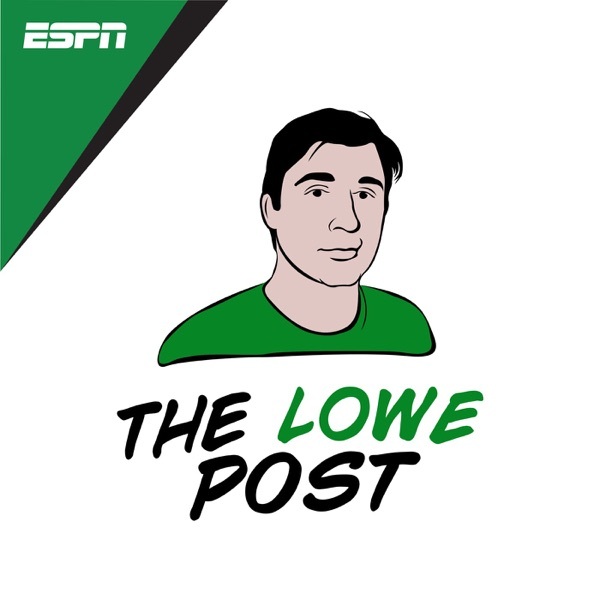 Zach Lowe talks to Brian Windhorst about LeBron's weird game, Cavs-Celtics and the looming Finals trilogy. Zach talks to Memphis star Mike Conley about David Fizdale's all-time rant, his rocky NBA start, his friendship with Marc Gasol, and more. Zach talks to ESPN's Doris Burke about Pop's rant, Spurs-Warriors, her playing career, the Eastern Conference finals, and more. Zach talks to Sam Amick of USA Today about going behind the scenes with the Rockets and Mike D'Antoni, what happened to James Harden, the Spurs, and more. Zach talks to Jeff Van Gundy about the Cavs-Warriors collision course, Wizards-Celtics, Rockets-Spurs, and more. Zach talks to ESPN.com's Kevin Arnovitz about the potential end of Lob City, the Grizzlies' future, and more. Zach talks to Howard Beck of Bleacher Report about Michael Jordan's giant shadow, the playoffs, Russell Westbrook, James Harden, and more. Zach talks to ESPN's Kevin Arnovitz about the four Western Conference first-round playoff series, Russell Westbrook, Hawks-Wizards and more. Zach talks to ESPN.com's Tom Haberstroh about Celtics-Bulls, Cavs-Pacers, and more. Zach talks to Eric Koreen of The Athletic about the Raptors-Bucks series. Zach and ESPN's David Thorpe go rapid-fire through the eight first-round playoff series. Zach talks to Jeff Van Gundy about resting, the MVP race, other awards, and playoff picks.